Frank Capra was in the beginning of a hot streak in the Depression ravaged mid-thirties. After sweeping the Academy Awards with It Happened One Night in 1934, Capra would be rewarded with a second Oscar for Best Director two years later with Mr. Deeds Goes to Town. This little romantic comedy would touch a nerve with Depression era moviegoers, as Longfellow Deeds stood for the values that had once made America great. In just a few short years a second world war would ravage the world, and the innocence that was at the heart of this film would be lost forever. Longfellow Deeds (Gary Cooper) is a quiet and unfettered free spirit who writes poetry for greeting cards in his pastoral home in Mandrake Falls, Vermont. When a small group of lawyers arrive in town and inform him that a distant uncle has died and left him $20 million, he receives the news with not so much as a sigh. They convince him to move to New York City so that he can live the lifestyle befitting a man of his wealth and newfound stature. New York is a wild town to be unleashed upon with an unlimited bankroll and soon the newspapers are having a field day with his drunken exploits. One journalist tries a different angle to out scoop her rivals and enter Deeds’ life. ‘Babe’ Bennett (Jean Arthur) is a street-wise strumpet who uses her charms and looks to entice Longfellow into believing that she is a damsel-in-distress. The chivalrous nature of his personality allows him to be easily swayed by the ruse and suddenly Longfellow believes he is in love. At first Babe regales in recounting for her readers the eccentric exploits of this bumpkin from the country, but in short time she sees the genuine humanity in his character and she too falls in love. But when Longfellow learns of her true identity, he is heartbroken and decides that the money he has inherited is only causing him pain and frustration, so he decides to give it away. When his lawyers learn of his plan to give the money away equally to anyone who can prove poverty, they panic. For years they have been slowly embezzling money from his uncle’s estate and hiding their theft with crafty accountancy. To cover their crime they try to have Longfellow declared legally incompetent and ask the court to make them the trustees of the estate. At his hearing, Longfellow says nothing, as witness after witness relates for the judge all the peculiar antics of his recent escapades in the Big Apple. Finally after Babe proves to him that his cause is the righteous path to follow, he speaks to the court in the homespun manner that screams from his soul. His earthy eloquence convinces the judge that he is an honest and deep thinking man who possesses the faculties needed to handle the affairs of his own life, and the charges of incompetence are dismissed. These would be breakout roles for the 2 stars of the film. Gary Cooper had started his career in silent films, but as yet, had not found his niche in Hollywood. 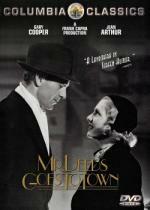 Longfellow Deeds was the beginning of a string of ‘aw shucks’ type roles that Cooper played so well. The other breakout performance was from Jean Arthur. She too had started in silent films, but it took the advent of talking pictures to let this caged bird sing. Ms. Arthur’s high-pitched warbling and pretty looks would make her a perennial favorite amongst movie fans for many years to come. If you’re looking for a ‘feel good’ movie, and you’re not too ‘pixilated’, this is as good a place to start. As time goes on, I find that You Can't Take it with You has become my favorite Capra film. I actually contemplated using Grandpa Vanderhof as my forum alias when I signed up to this forum.